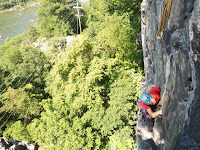 Please check out Robin's Bouldering blog which is currently featuring two posts on climbing at Harpers Ferry. The first post is on a trip to the Train Tunnel Wall and the second post is on a bouldering tour of Elk Ridge. He tells of his encounters with exposure during his first roped adventure in a long time and he created a nice video of some Elk Ridge boulder problems. Robin gave his experience at Harpers Ferry a positive review. Many thanks to Robin and Dan for coming out. I've had some inquiries lately from different people about the grades of the bouldering problems as shown in the guide. Unintentionally, a large portion of the grades may be sandbagged. Please take the grades with a grain of salt and keep in mind that the problem may be harder than the grade it is given in the guide. This is due to having the problems wired from years of circuiting on them, I thought V4 was the end of the line of my abilities, I'm tall so my beta is different than a lot of other climbers, and these problems just haven't seen the kind of traffic other areas get so the grades are not based on a consensus rating. Don't let the mis-rating get you down. 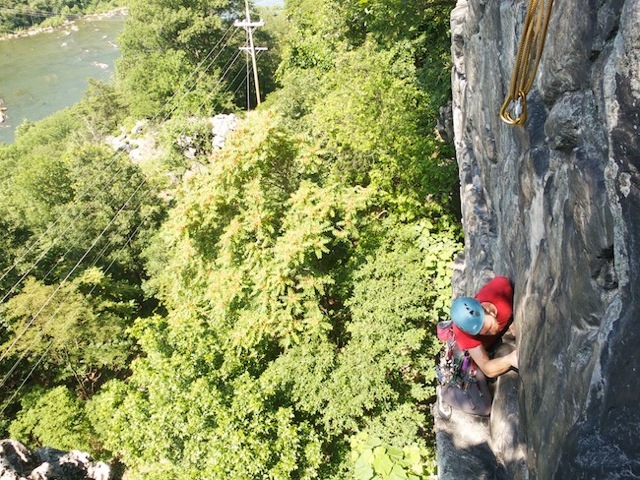 Just get out there and enjoy the climbing and then pass on to your friends what you think it should be graded. Eventually they will settle in on being accurate. Thanks to all who came out to Balcony Jr. and the Secret Six Tavern on Saturday for food and beers and good conversation. The PA and MD crew was a great mix. We had a blast and did some fantastic climbing. I'll post a pic or two when they become available. On Friday Robin Close and Dan Montague came out for a bouldering tour of Elk Ridge. It was a ton of fun and we sent a highball project on the 2012 top projects list. Look for images and video to emerge in the near future from Robins's blog . Gathering - 6/16/12 - Balcony Jr.
On Saturday, June 16, 2012, a group of rock climbers is meeting up at Balcony Jr. from approximately 8am to 12:30 pm. This is not a guided activity, you are responsible for your own safety, so please only come if you are experienced or are with an experienced climber. All those meeting these criteria are welcome to join us. At 12:30pm we will be headed to the Secret Six Tavern for lunch and beers. As always, parking is limited in Harpers Ferry so please carpool. The Secret Six Tavern is in Harpers Ferry. We will walk to the tavern as parking in the town itself is near impossible. The weather is forecast to be great.